Wash the chicken breasts & drain completely. 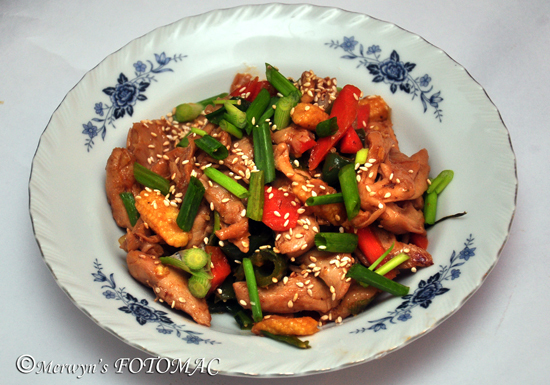 Cut the chicken into long strips & marinate it with ginger – garlic pastes, dark soya sauce, red chilli sauce for about an hour. (preferably overnight). Heat oil in a wok/kadhai till hot. Gently slide in the marinated chicken & saute on high for about 2 to 3 mins. Drain the chicken using a slotted spoon & keep aside. In the same oil, saute first the baby corn for about a minute, then add the capsicum,red bell pepper; saute & toss for about 2 mins. Then add the reserved cooked chicken, a pinch of sugar, a dash of vinegar & stir well. Keep sautéing & tossing for another 2 mins. Adjust salt to taste. (Sauces contain salt so use it sparingly). Toss in the spring onion greens & stir to cook for about a minute. Serve hot garnished with some spring onion greens & a sprinkling of toasted sesame seeds.